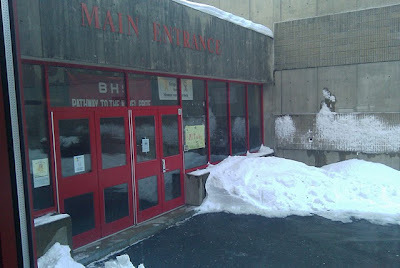 Aside from the snow sticking to the walls of the building, things looked pretty much the same here outside our main entrance as students returned from vacation. However, I can't help wondering how things will change inside the doors as we move into 2010 and beyond. What will be different as we continue our efforts to provide a relevant education for our students that will help them achieve success in the rapidly changing world outside our doors? With this in mind, I will continue to talk about various technology tools that I think may be beneficial in helping us move forward. First off, I speak for myself and probably a few others in regards to putting a new focus on getting organized in the new year. In this regard, I read a great post from the Learning in Maine Blog on the topic of Getting Organized. My favorite link from this post was to a post by award-winning Maine blogger (Richard Byrne) who had a post last week titled 15 Tools To Help Students Get Organized. Try a few of these tools. You will be amazed. Besides the organization aspect which is one goal, I have also set a couple of other goals. I think that it is important for everyone to do this with the amazing list of technological resources growing by the day. Let me know if you have a resource that you use that you think others would find useful and I will do the same. I have been reading Daniel Pink's new book as I mentioned in a post on New Year's Day. In promoting his new book, Pink held a webinar on New Year's Day during which he encouraged all of the participants to ask themselves two questions each day. 1. Was I better today than yesterday? and 2. What do I want to be remembered for? For me, I will be concentrating more on the first question and looking for concrete actions that help me answer this small by substantial question. Pink noted in the discussion that we all should take part in DIY (Do It Yourself) evaluations where we call ourselves into our own offices and check on how we are doing in reaching goals or benchmarks that we have set for ourselves. From my experience, the most productive employees are much harder on themselves than any supervisor would be.